From hostess gifts to stocking stuffers, we have something for everyone. Not only is The Fresh Market your source for quality ingredients and culinary inspiration—we also offer premium, delicious gifts for everyone on your list. 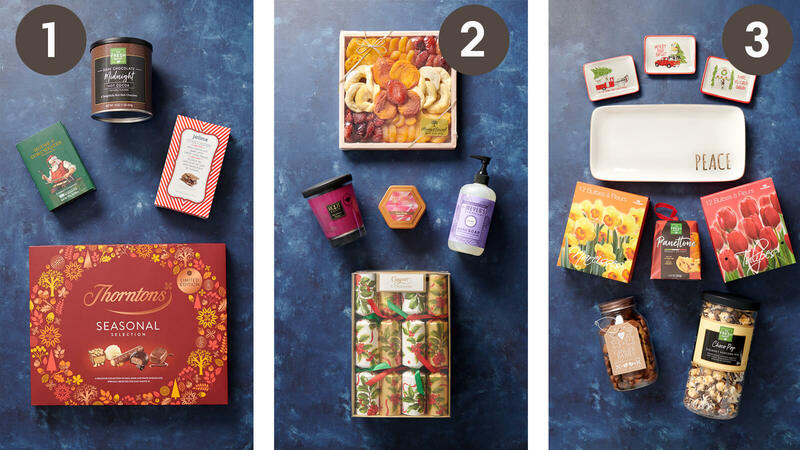 If you’re headed to a holiday gathering and need a quick host or hostess gift, opt for a decorative tea towel, high-quality chocolates, decadent cookies or any number of seasonal favorites. We also have goodies for the bakers in your life, plus coffee, tea and mixers for your favorite beverage enthusiasts. Know someone who loves Italian food? (Who doesn’t?) Our oils, pasta and robust sauces are the perfect fit. Stop by your neighborhood store today—you’re sure to find just the thing! 1. For the Chocolate Lover Made with only the highest quality Belgian chocolate sourced from sustainably grown cocoa beans, Jelina Chocolates are truly exquisite. We also love Thorntons Chocolate, especially their wide array of luscious truffles, as well as House of Dorchester Chocolate. A classic selection of milk, white and dark chocolates, House of Dorchester chocolates are carefully crafted and beautifully presented in a ready-to-give book box. Know someone who prefers to sip her chocolate? Our new Dark Chocolate Cocoa is a semi-sweet delight with a smooth texture and rich taste. 2. For the Entertainer If you have a friend or family member who always has a candle (or three) lit when you come over, they’ll love our selection of Root Candles. Seasonal scents include Cinnamon Clove, Pine Needle and Peppermint Bark. Another gift they’re sure to use: Mrs. Meyer’s Hand Soap. Available in fresh, seasonal scents like Iowa Pine, Orange Clove and Peppermint, Mrs. Meyer’s soaps are made with plant-derived ingredients and rich essential oils. For something a little more festive, give our Harry and David Dried Fruit Tray featuring an array of tree-ripened, hand-picked fruits like Turkish apricots, pears, Angelino plums, apple rings and yellow peaches. We also have Caspari Holiday Crackers that pop open to reveal a hidden surprise—we even have crackers for your furry friends! 3. For the Hostess You can’t go wrong with classic holiday gifts, like The Fresh Market Panettone. Our panettone is produced in Italy using the classic “Piedmont Region” method, where a longer leavening cycle yields superior texture, aroma and flavor. Choose between regular and mini sizes. If your host or hostess has a green thumb, try our Bulb Gift Kits that make it easy to plant your own paperwhites, amaryllis and hyacinths. For snackers, opt for The Fresh Market Gourmet Popcorn Mix handcrafted with caramel popcorn and crushed peppermint, or baked-by-hand Rustic Bakery Christmas Cookie Jars. Want to give something that will last? Our stoneware platters and ceramic holiday dishes from Creative Co-Op make gorgeous gifts or unique additions to gift baskets. 1. For the Kids It’s always fun to find unique and exciting gifts for the kids in your life. For a wow-worthy stocking stuffer (as long as you have a big stocking! ), try our Jumbo Candy Cane. We also have Plush Animals with Candy Canes that make it easy to give two gifts in one. Know a kid who loves to play with her food? Hoch Edible Snow is 100% safe to eat and fun to play with, too. If you’d like to give something that everyone in the family can enjoy together, the Chocomaker Winter Cabin Kit makes for a fun, interactive gift. Each kit comes with three candy molds, chocolate wafers for building the structure and a variety of candy for decorating. 2. For the Foodie Everyone can use kitchen essentials, like Tea Towels and Aprons—especially the foodies in your life. Our tea towels are available in holiday and everyday designs and make a thoughtful addition to a custom gift baskets. 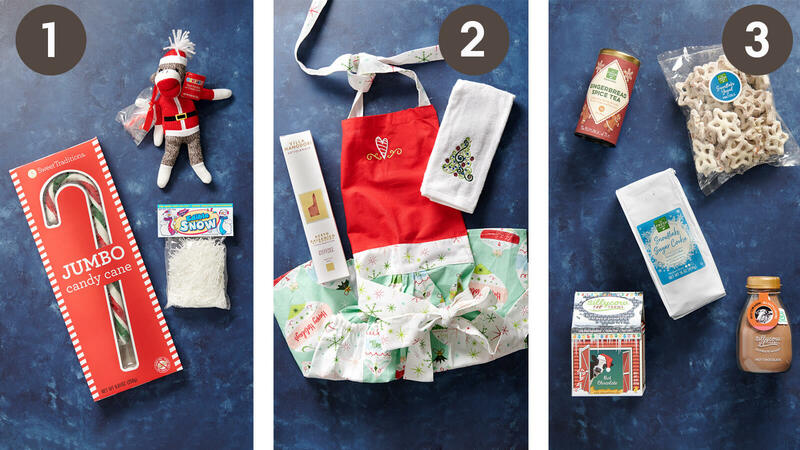 If you’d like to add an apron, choose from everyday styles and holiday favorites (including festive elf and Mrs. Claus designs). Another kitchen must-have for the home cook: Villa Manodori Balsamic Vinegar. This versatile, artisanal Italian vinegar is made in limited quantities and aged in a series of oak, chestnut and juniper barrels for rich, robust flavor. 3. For the Homebody If you know someone who likes to cozy up at home, we have just the thing. Treat them to our Snowflake Pretzels + Coffee Combo: Yogurt covered pretzels paired with Snowflake Sugar Cookie Coffee, which is buttery with notes of vanilla and spice (and available for a limited time!). We also love Silly Cow Hot Chocolate, which is certified fair trade and non-GMO, with no high fructose corn syrup, trans fats or artificial ingredients, as well as our own Holiday Tea: Caffeine-free herbal rooibos, with rich flavors of gingerbread, cinnamon and vanilla—perfect for a cozy night in! Some friends and family members are easy to shop for, while others can be a challenge! 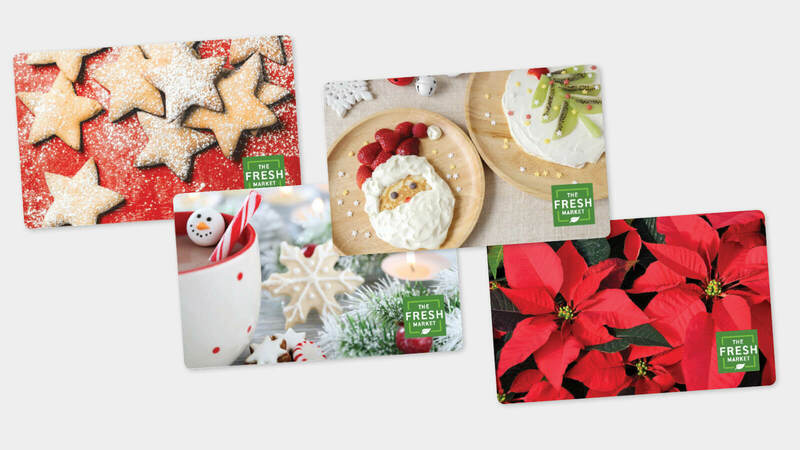 Luckily, you can’t go wrong with a gift card from The Fresh Market. Our gift cards are a delectable way for all the food-lovers on your list to find something exquisite to savor. The more you give, the more you’ll get. Now through December 24, 2017, receive a $5 off coupon* with every $50 gift card purchase from your neighborhood store. Use your coupons between January 1 and March 31, 2018 to save on your own gourmet favorites—or try something new! *Limit of $500 gift card purchase per transaction and $50 in coupons. Offer available in stores only and valid on gift card purchases made now through December 24, 2017. Gift cards may not be used to purchase gift cards. Want to make your own custom holiday gift basket this season? We can help! Our gift baskets are an easy way to spread holiday cheer—and create just the thing for that hard-to-shop-for someone. First, let a gift center specialist or store manager know that you'd like to make a basket and let us assemble it for you. You can also provide us with a list of items and come back for your basket at a later time. If you need some inspiration, here are some of our go-to ideas for food-lovers, adventurous eaters, bakers and more! 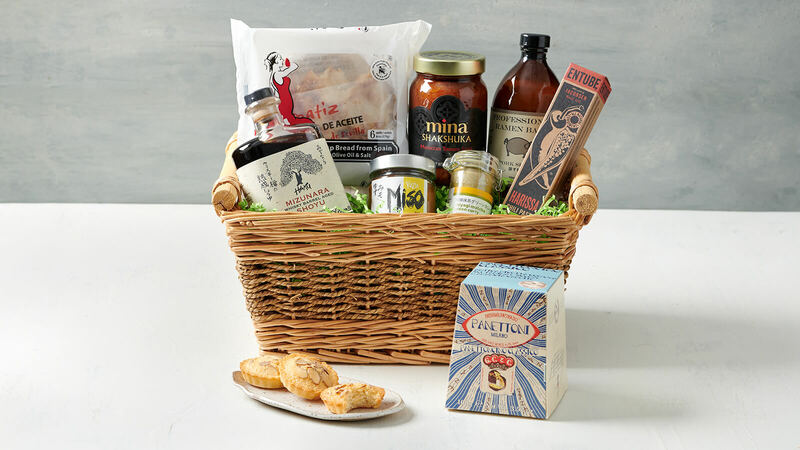 From smoked sea salt to crackers specifically designed to pair with cheese, this basket has everything to delight the sophisticated foodie in your life. One of our favorite items: Lemons that are salted and then pickled in their own juices, delicious in white wine sauces for pasta or used with fresh herbs to season poultry or fish. 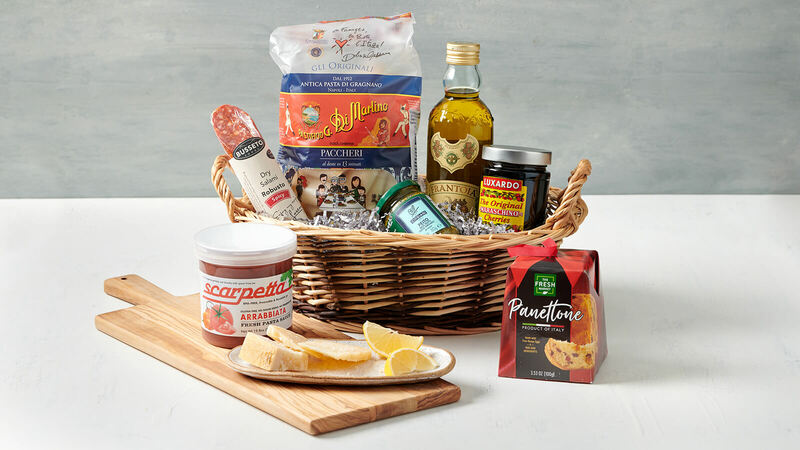 This basket is brimming with Italian favorites. From the original maraschino cherry to aged Parmesan and top-notch extra virgin olive oil, it’s guaranteed to tempt a trip to Italy! 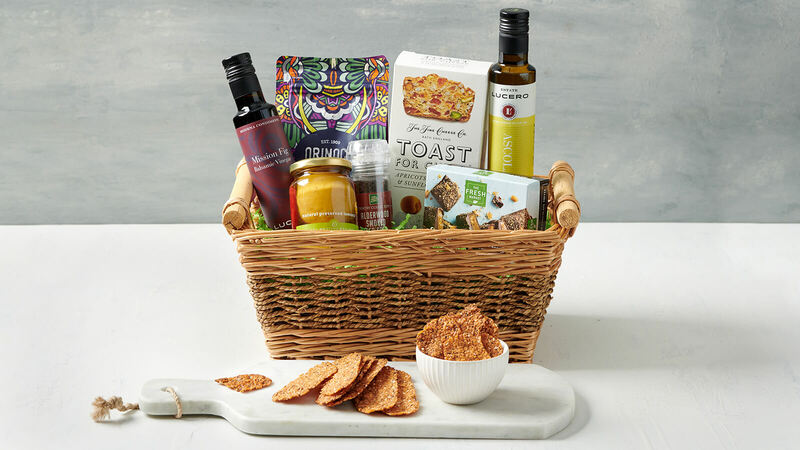 Include some inspiration with your basket using some of our favorite recipes, like Cacio e Pepe (which calls for olive oil, pasta and Parmesan) or savory Parmesan Thyme Crisps. Inspire someone’s taste buds with goodies from countries all over the globe. With unique items like yuzu miso and matcha green curry, it’s perfect for the home cook who’s always seeking new adventures in the kitchen. We love to use Tsuki Professional Ramen Base in our recipe for Easy Weeknight Ramen—it’s much tastier than what you’ll find in a pre-packaged pouch! 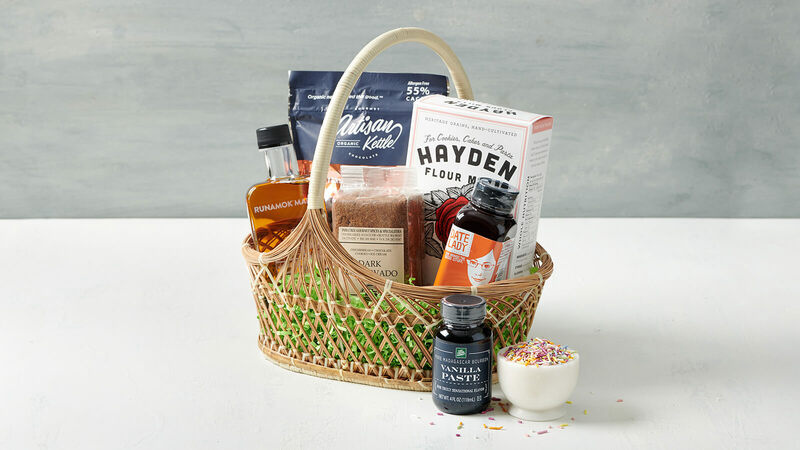 This sweet basket has everything for the baker in your life, including whimsical colored sprinkles free of artificial dyes and a pastry flour that’s freshly milled to order. Try Date Lady Organic Pure Maple Syrup in our recipe for Date Glazed Brussels Sprouts with Pancetta and Hazelnuts, or mix Runamok Bourbon Barrel-Aged Maple Syrup with creamy mascarpone in our recipe for Pumpkin Custard Tart with Maple Mascarpone Whipped Cream. We also love India Tree Dark Muscovado Sugar in Maple Pecan Sticky Buns, and Artisan Kettle Organic Chocolate in our Pear and Bittersweet Chocolate Yogurt Cake with Ganache Glaze. 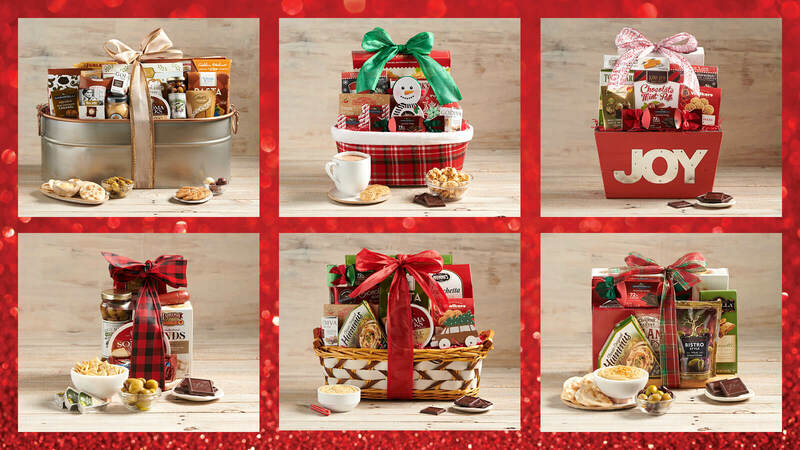 Sweet and savory, big and small—you're sure to find a gift basket to delight one and all! Need a gift (or three)? Our in-store selection of curated Gift Baskets make gorgeous gifts for everyone on your list! If you’re shopping for someone with a sweet tooth, opt for one of our baskets filled with decadent chocolates and cookies. We also have baskets filled with savory crackers and spreads, olives, premium snack mixes and more. Prices range from $29.99 for smaller gifts to $99.99 for the largest available gift basket, loaded with sweet and savory treats. Each gourmet package comes wrapped and finished with a festive ribbon so it's ready to give—all you have to do is choose the lucky recipient. From family, friends and neighbors to colleagues, employees, teachers and more, you'll find a great selection of gift-baskets-to-go for all the food-lovers on your list. Hurry to your neighborhood store to get yours before they're gone!